After my parents’ divorce when I was 6, my mom dated an Israeli man. I always looked forward to our stays at his apartment in West LA because I got to watch all the TV I wanted in the morning while eating the treats he would buy us from a nearby bakery. Marzipan-oozing bear claws, rich rugelach, and flaky chocolate danishes were undeniably better breakfast options than the usual shredded wheat with low-fat milk, and not even his BO-filled hugs could dampen my anticipation of these blissful, sugar-high mornings. 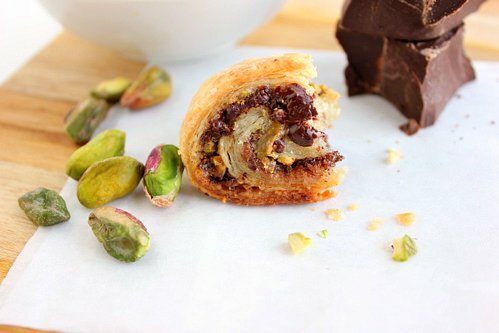 My relationship with chocolate rugelach turned out to be longer-lasting than my mom’s with her beau, however; she decided that, among other deal-breakers, he didn’t take adequate care of his health. (‘He eats COOKIES for BREAKFAST!’ I remember her exclaiming to me, as though this were on par with molesting small children or a predilection for wearing ladies’ underthings.) 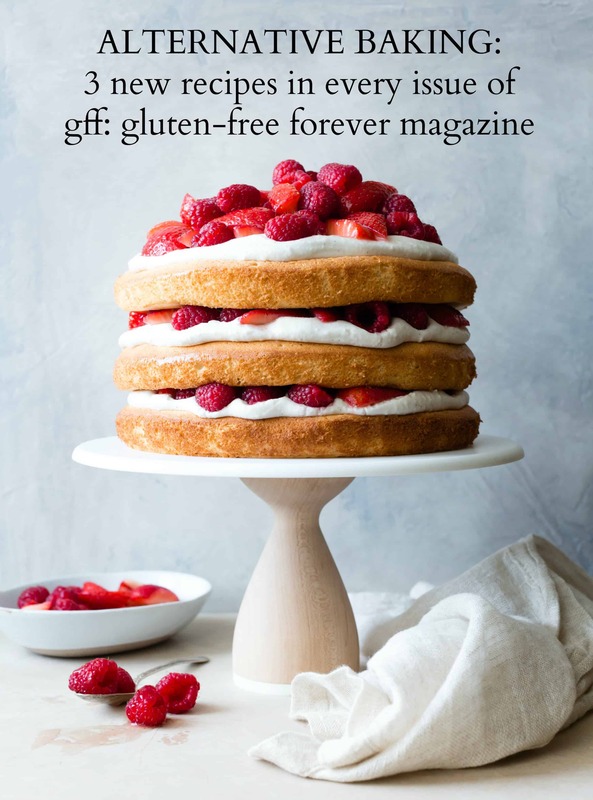 And while my addiction to television eventually dwindled, my love of sweet things – clearly – did not. 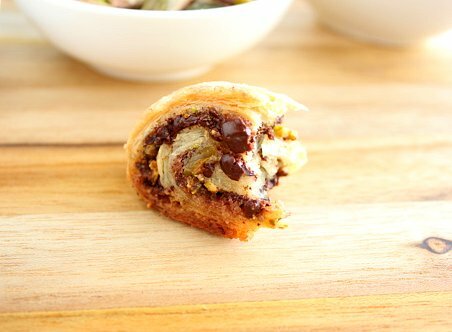 When I found a recipe for rugelach many years later in Molly Katzen’s Enchanted Broccoli Forest, I immediately gave them a go. 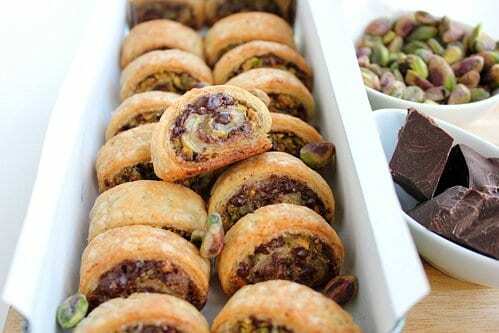 These rugelach called for a schmear of jam and a flurry of chopped nuts and raisins. They were pretty awesome, and I was once again hooked. But then I found another recipe, from Cook’s Illustrated, and, with all due respect to Ms. Katzen, this one took the cookie. 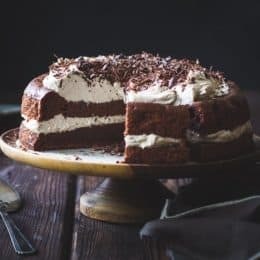 The barely-sweetened dough held copious amounts of butter and cream cheese, with a touch of sour cream to make the dough extra-flaky (the acids in the sour cream go to work on the flour’s glutens, keeping the dough tender and ousting toughness). 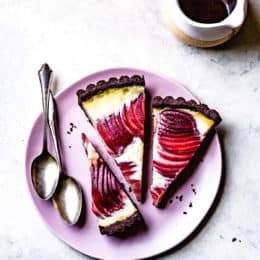 But best of all was the chocolate variation, in which one could forgo the jam altogether for a layer of mini chocolate chips, nuts, and cinnamon sugar. Then came Alice Medrich’s rugelach recipe in her latest tome on cookies, in which she gives permission to put any darn thing you want in your rugelach, including cocoa nibs, bittersweet chocolate, or even forgoing these complications and sprinkling the dough simply with cardamom sugar for something akin to gussied-up palmiers. 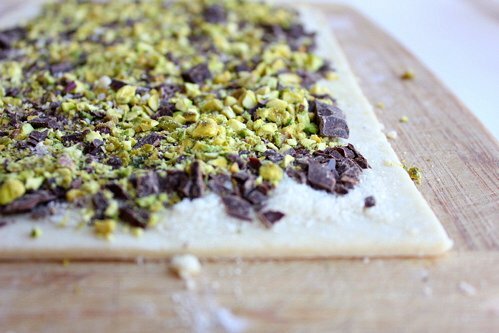 Taking a cue from Ms. Medrich’s refined simplicity, I mixed up a batch of Cook’s dough and sprinkled it with plain white sugar, a finely chopped bar of Scharffenberger chocolate, and some verdant pistachios. I’ve found that rolling the rugelach crescent-style results in a loss of more filling, so I make these in the roulade style, rolled up like cinnamon buns and sliced crosswise into pretty little spirals. Cook’s calls for glazing the tops with a mixture of egg yolks and milk, but I kept it simple and left the tops plain, and was glad I did; the cookies were perfectly sweet without the extra sugar, and the tops prettily browned. These cookie-sized pastries are sweet enough to enjoy for dessert or a tea-time snack, but subtle enough so that you could even eat them for breakfast. At least, I wouldn’t dump you for it. 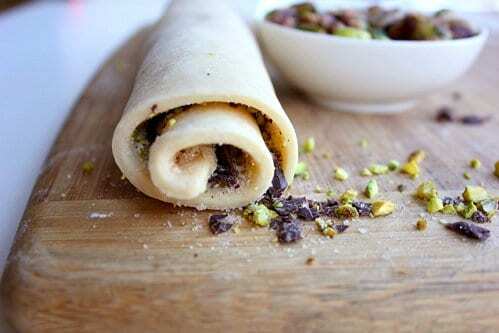 This classic dough can handle many variations: smear a slick of smooth jam over the dough, swap out any nut for the pistachios, trade the chocolate for dried currants, and add cinnamon or cardamom to the sugar. 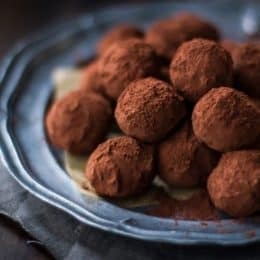 As always, be sure to use a good chocolate that you like the flavor of on its own; I used Scharffenberger’s bittersweet chocolate which has a cacao mass of 70%. If I were to use a sweeter chocolate, I would decrease the sugar. But that’s just me. 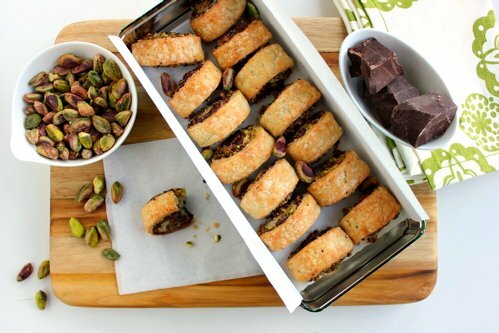 You have several do-ahead options for rugelach: freeze the dough for up to 1 month, or assemble and fill the rugelach and freeze them, unbaked, for up to 1 month, then bake them straight from the freezer. In the bowl of a food processor, combine the flour, sugar and salt. Scatter the butter pieces, cream cheese, and sour cream over the top, and pulse about sixteen times until the dough just clumps together – it will look like chunky cottage cheese. 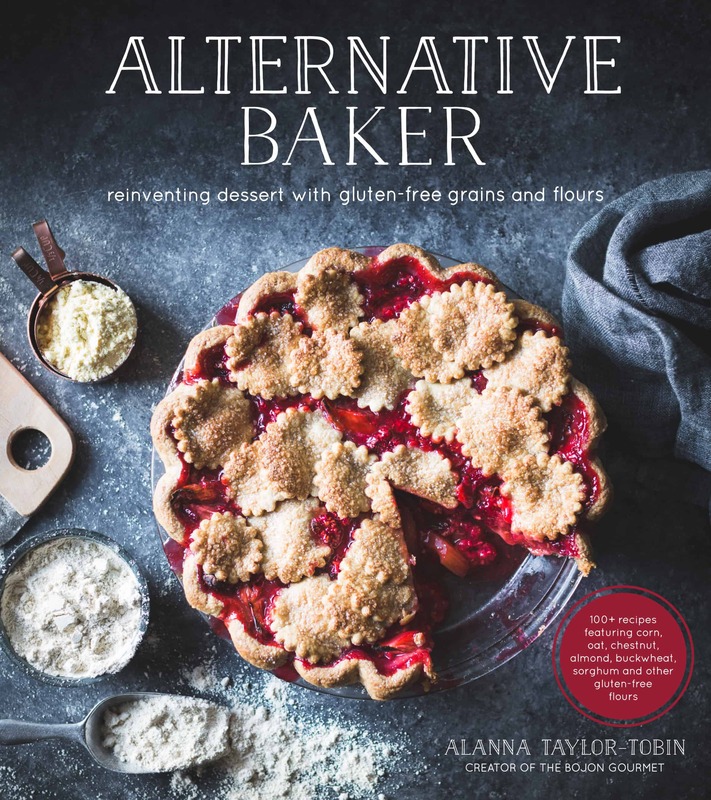 (You can also do this in a stand mixer fitted with the paddle attachment, or, probably, by hand the way you would make pie dough.) Turn the dough out onto a lightly floured surface and divide it into 4 equal portions. Press each portion into an 8×4″ rectangle, wrap in plastic, and chill for at least 30 minutes or up to 2 days (or place the dough in a freezer bag and freeze for up to 1 month; defrost in the fridge overnight before using). Stir the sugar and salt together in a small bowl. 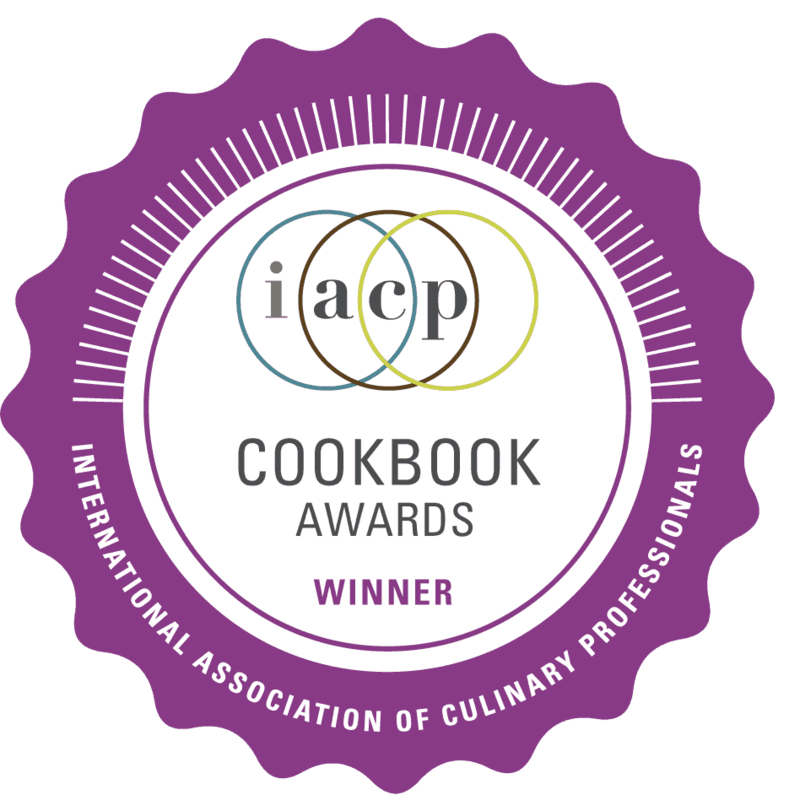 Have the chopped chocolate and nuts standing by in small bowls. 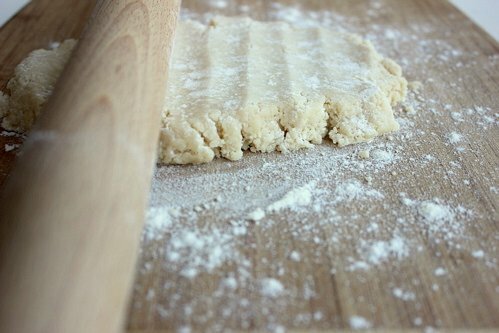 Remove a dough rectangle from the fridge and place it on a lightly floured surface. Roll the dough into a 12×8″ rectangle with a long side facing you – it will be about 1/8″ thick. Trim the edges clean. Leaving a 1″ boarder on the top edge, sprinkle the dough evenly with 2 tablespoons of the seasoned sugar. Sprinkle 1/3 cup of the chocolate over the sugar, then 1/3 cup of the chopped nuts. Use your hands to gently but firmly press the filling into the dough. Starting from the bottom edge, roll the dough up into a tight cylinder with the seam on the bottom. Cut the cylinder into 3/4-1″ lengths. Place the cut rugelach seam-side-down on a sheet pan and place the pan in the freezer. Repeat with the remaining rectangles of dough, and freeze all the rugelach until firm, at least 20 minutes. While the rugelach freeze, position racks in the upper and lower thirds of the oven and preheat to 375º. 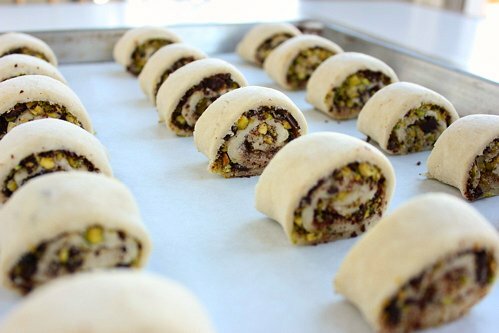 Place the frozen rugelach 2 inches apart on sheet pans lined with parchment paper. Bake the rugelach until golden on top, rotating front to back and top to bottom halfway through baking, about 20 minutes. 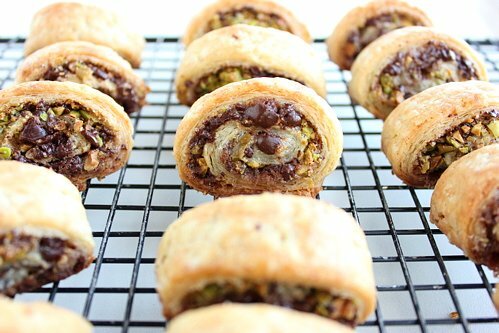 Immediately remove the rugelach to cooling racks so that they don’t form a foot of sugary goo around their bases and let cool completely. 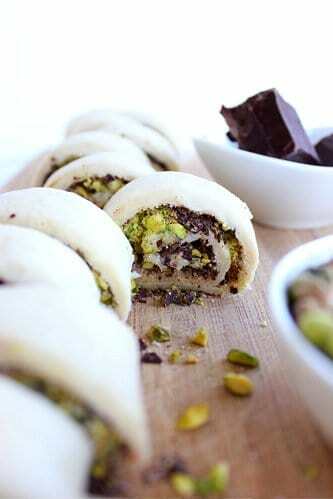 Rugelach keep well for up to 5 days at room temperature in an air-tight container. Heavenly. Love your photos, too! Oooh, I will have to look into kolache – they sound like my kinda thing!